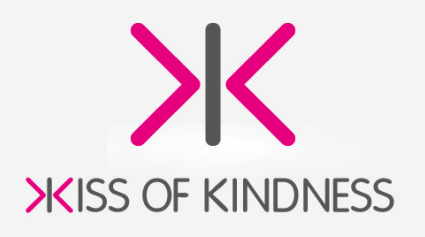 The logo you see at the top of the page is the 'Kiss of Kindness'. This little symbol is going to change the world. It is the first, true global sign for Kindness. It is about to enter your life Big Time. With your help, we're going to 'Kiss the World Better' by dispersing 'Kisses of Kindness' in their billions. They are going to show up everywhere – on walls, in photos, on Facebook, on Twitter, in emails and texts, on cars and buses, even on Justin Bieber! The idea is simple. Every time you see a Kiss of Kindness, you will be reminded that kind people exist in the world. We're all surrounded by them, but they just don't make the headlines. The more you open your eyes to Kindness and Kind People, the kinder you will become as a person. KissBank has introduced the 'SPONSORED CHARITY KISS'. The idea is simple. 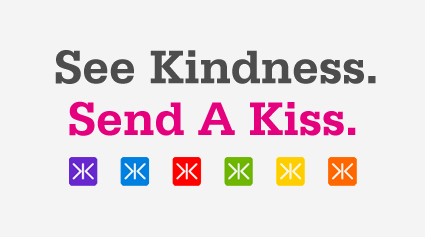 Every month you can donate up to 25 of the Kisses you received from other people to support KissBank's 'Charity of the Month' and sponsors will match every Kiss with a cash donation. We've created a range of images, slogans and screensavers that you can download to personalise documents and send to your friends and colleagues to help us spread our philosophy of Kindness. We've created a gallery of iconic images given the "KissBank" treatment and images that illustrate the power of our Kiss Out campaign. We hope you'll send us your images too. We have a range of KissBank merchandise you can buy for yourself or to use in a Kiss of Kindness event!